Genie Home Products is an American manufacturer of home security products based in Alliance, Ohio. The company specialize in keyless, remote-controlled garage entry systems. If you experience problems with your Genie garage door opener, there are several steps you can run through to try to clear up the problem. Common issues include loss of door function or problems opening and closing the garage door. Allow roughly 20 minutes for this task. Check the mechanism's "Source" and "Sensor" LEDs. If both the red "Source" and green "Sensor" lights are on and not blinking, then the door mechanism is working properly. If one or both of the lights are off, check the fuses, breakers and plugs for problems. If just the red "Source" LED is out unplug the mechanism, check the wiring and plug it back in. Check the "Source" and "Sensor" LEDs to see if they are blinking. If the red source LED is blinking twice with the "Sensor" light lit, check the door sensor for obstruction and make sure nothing is obstructing the source of the beam. If the "Source" LED is blinking twice and the "Sensor" light is out, check the wiring or call customer service (see the Resources section). If the "Source" LED is blinking three or four times, check for interference from other electronics or call customer service. Check the "Status" LED light. If it is blinking, try unplugging the mechanism for a few seconds. If the problem persists, check to make sure the garage door is in good enough condition to open (i.e., not rusted.) Make sure the door is not in vacation lock mode and the force settings are correctly set up. If problems persist, check the mechanism or have an authorized dealer do it for you. Check the power supply to the entry keypad if you cannot access your garage. Make sure you are entering the correct code and that the fuse, breakers and wiring are intact if you cannot access your garage from the keypad. 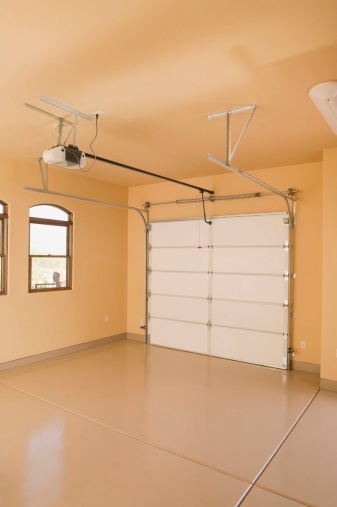 Check the sensor for dirt or obstruction if the garage door behaves erratically. Check your keyless entry sensor if you cannot open the garage from your car. Make sure you are in range of the garage and nothing is blocking the signal. Make sure the antenna for the keyless entry sensor is positioned correctly and the car is facing the garage when you press the button. Contact Genie if problems persist with your garage door opener. A qualified technician can visit your home to evaluate and repair the problem. See the Resources section for details.